Turkish wines…? Did anyone really know such a thing existed? Yes, the country of Turkey is in close proximity to Greece, but Turkey just isn’t a country you’d expect wine to come from. Neither the Professional Wine Atlas by Jancis Robinson and Hugh Johnson nor the WSET Advanced course study book have any information about the varietals, the terroir, the history… NOTHING. Unfortunately the white was less than chilled by the time it made it into my tasting glass yesterday afternoon, but the nose was still full of tropical fruits, ripe bananas and citrus. The color was a clean, very pale lemon. On the palate I tasted a great deal if minerality with tropical fruits and citrus, the acid was incredibly high leaving my mouth salivating for many minutes after I’d swallowed the delicious elixir. Though lighter in body, the flavour profile of the Narince grape seems to mirror that of a young, unoaked chardonnay. Update: 12:10pm – I have now tasted the white (chilled) and the red. Both outstanding, pleasantly surprised by what I found. 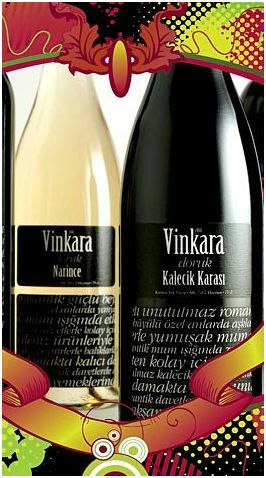 The warm climate of Turkey has made both of these wines incredibly light in body but has not sacrificed the flavor. I can imagine sipping these while eating hummus on a hot dessert day. The red is full of cherries in the front of the mouth with incredible acid, light tannin. Very pale garnet coloring despite it’s young age, similar to that of a Pinot Noir. The Narince is 100% better when chilled. Tropical, sweet fruits meet the nose and on the palate continue with a distinct taste of Guava enhancing the image of laying in the sipping on this delicate wine.